Put down that candy bar and chew on this: in light of the countless dangers of consuming too much sugar, the World Health Organization has changed its sugar recommendation—advising no more than 5 percent of your daily calories should come from the sweet stuff, down from the previously recommended 10 percent. Considering the average American consumes close to 5 grams each day, we have some work to do. The WHO’s expert panel reviewed some 9,000 studies on sugar intake and came to the conclusion that it most definitely affects your risk for obesity and thusly, obesity-related disease. 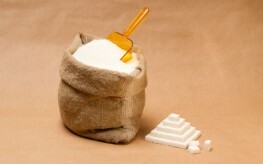 By reducing sugar intake, the WHO says, you can reduce your risk of cavities and obesity (Duh)? Their analysis refers not only to table sugar found in baked goods, but honey, syrups (like HFCS), and fruit juices—but not those found naturally occurring in fruits. The announcement is sure to anger the U.S. sugar industry, who about lost it over a decade ago when WHO suggested the 10 percent recommendation. As a matter of fact, back then, the industry lobbied Congress to threaten a withdraw of millions in funding to the WHO if they didn’t reverse their position. “The less sugar you’re eating, the better,” said Dr. Robert Lustig, of the University of California and expert on the dangers of sugar. “If the sugar threshold is lowered, I think breakfast cereal is going to have a really hard time justifying its existence,” he said. Members of the WHO panel say the 5 percent threshold is a long-shot for many consumers, but a worthwhile goal. “We should aim for 5 percent if we can…but 10 percent is more realistic,” said Dr. Francesco Branca, WHO’s director for nutrition. A single can of soda would blow a child’s entire daily sugar allotment. And many children consume this much, if not more every single day. Researchers from the CDC found the average American gets 15 percent of their calories from sugar. A reduction to 10 percent, let alone five, would be a vast improvement and—for many—a tough challenge. You can immediately slash your own sugar consumption by focusing on the beverages you drink. Sodas, fruit juices, energy drinks, and fancy gourmet coffees are all loaded with the sweet stuff. Eliminating these beverages alone could help you reach a more reasonable level of sugar intake.